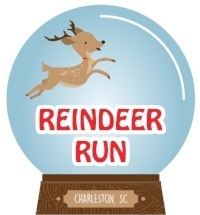 The Reindeer Run, presented by Half-Moon Outfitters, is a family- oriented, pet-friendly 5k run/walk through the lower peninsula of downtown Charleston, SC, and will be held on Saturday, December 8, 2018. The event has grown significantly over the years; from only a few hundred participants to record attendance of over 3,500 runners. Throughout the history of the event, the Charitable Society of Charleston (CSC) has donated over $1,000,000 to MUSC Children’s Hospital. In 2017 alone, CSC donated $50,000 to the organization. The funds generated from the Reindeer Run are helping the campaign to build the new MUSC Shawn Jenkins Children’s Hospital that is set to open its doors in 2019. This hospital will provide more spacious, family-centered amenities and expanded services, including an expanded neonatal intensive care unit, an entire floor dedicated to the care of children with cancer, and the most comprehensive pediatric heart center in South Carolina. Race Day Information: The 2018 Reindeer Run starts at 9:00am on Saturday, December 8, 2018, near the corner of East Bay and Queen Street. This beautiful 5k race route takes you along the beautiful Charleston Battery and brings you right back to where you started to finish the race. Afterward, there is an after-party in the official Beer Garden or visit one of the many nearby restaurants! Costume Contest: The costume contest is a crowd favorite and it is back again for 2018. Dress up in your festive best and enter the contest. Judging begins around 10:00 am behind the stage. Our categories include Adult Individual, Child Individual, Group and Dog. We award the top 3 from each category with lots of great prizes and gift cards from restaurants and attractions around the Charleston area. Come dressed to win! This entry was posted in Events, Fundraisers, Kids event. Bookmark the permalink.